Here's Issue 29! The articles this week won't be in great detail since the JBC is hosting the 2nd Annaul Gtoon Tournament. This year we're actually participating in it. So good luck to all of those who entered and remember all round 1 games need to be completed by the 11th. The JBC is preparing for the 2nd Annual Gtoon Tournament. With a total of sixteen competitors the JBC team consisting of Dr. Eric, Jonathan, and myself have been practicing non stop for the last two days. Well... we may have exaggerated that part but we're ready don't you worry. If you're reading this to get the type of deck we use you're out of luck. I've noticed Dr. Eric and Jon sneaking into my office trying to steal my Gtoons but I took care of that by putting one of the security bots by my desk. I still think Dr. Eric sent Jon in anyways which ended in Jon going to the emergency room. Luckily in the format that the tournament is set up the JBC doesn't have to play each other this round. So the JBC bids all of the competitors good luck in the first round. P.S. : For the love of all things holy don't beat us. So I’ve finally been given an ultimatum by Justin. I have fifteen minutes to write this article. So anyway, I’m looking around the room trying to get inspiration for something I can write about, something news-worthy. No…no….no…wait. There it is, there’s my story. It has come to my attention recently that my room has been expanded by exactly two inches. While that may not seem like a lot to you people out there, it has been a major renovation for me. Due to this new space, I have been able to bring my laptop into my office. This allows me to write this article while sitting in the comfortable enclosure of my room. Then, after I’m done writing this, I can publish this on the internet using the wireless connection that I’m currently leeching off of. I believe that this connection belongs to Double D, mostly because he’s the only one intelligent enough in Peach Creek to actually set it up. Unfortunately for him, he didn’t encrypt the connection, so he’s essentially placing out the welcome mat for anyone who wants to use his connection. Using what is known as a Trojan horse, I was able to spy on him and determine what the Eds’ next scam will be. It seems that they were recently doing a lot of research about dirigibles, that is to say "blimps". It appears that they plan to construct a blimp and use it to give tours to the kids of the cul-de-sac. Of course this will involve a fee that will probably be around $2. We can only hope that Double D decides to use helium instead of hydrogen, otherwise we might have another Hindenburg on our hands. 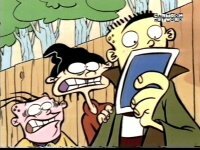 Well... this week there was a small dodgeball thing, not really a game more or less Kevin and Rolf just throwing bowling balls at the Eds after a failed bowling alley scam. But since I have to write an article I figured I'd report on it. The Eds score was negative 37 and Kevin and Rolf.... let's just say they missed no more then ten bones on each Ed. That's it, no more sports went down this week. There have been some speculations that a dodgeball league may be formed. A total of four teams of two or in the Ed's case three would be formed. We have reports that instead of bowling balls which were used today, regulation sized balls would be used instead. The court would be the Culde-sac. Double D has told the JBC that he thought of a great team name...The Average Eds. The Eds have no athletic talent and are going against teams who could demolish them. It would surely be a true underdog story if the Eds could pull it off. This is starting to sound like a movie I saw once. Anyway next week should mark the first game of the season. low prices and cool stuff! make our junk your treasure!